shelters and covers for the protection of the population, agencies of administration, communication centers, and medical and other institutions from enemy weapons of mass destruction in wartime. Of these, the most widespread are civil defense protective installations for the population. Before World War II (1939–45) various countries began building shelters, in cities within range of enemy aircraft, for the protection of their populations against toxic chemical agents. 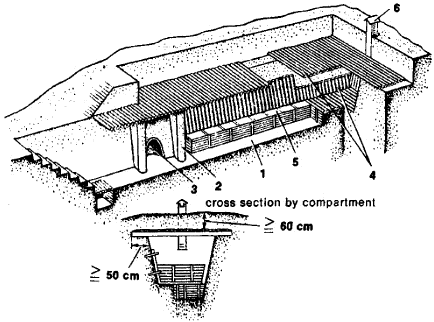 In the USSR local air defense agencies supervised the construction of numerous bombproof and gasproof shelters. The basements of various buildings were converted into shelters, special installations were built, and, in Moscow, subway stations were also used as bombproof shelters. When foreign armies began to be armed with nuclear weapons and other means of mass destruction, as well as with delivery systems of unlimited radius, it became necessary to protect the population of the entire country. Civil defense agencies direct the construction of civil defense protective installations. nuclear explosions as blast waves, radioactivity, and thermal radiation, from toxic chemical and bacteriological agents, and from high temperatures resulting from fires. They are built as a rule of reinforced concrete and are situated in the deeper recesses of buildings (on one or several floors) or outside buildings. In peacetime the shelters may be used as garages, warehouses, public eating facilities, or service premises. In the event of a threat of war they are made ready to shelter the population. Underground transportation structures, such as subways, tunnels, and underground street crossings, may also be equipped to provide shelter. The capacity of shelters ranges from several dozen to several thousand people. The sanitation and hygienic conditions required for a lengthy stay in the shelters are ensured by a filtration and ventilation system that supplies the necessary amount of air purified of noxious admixtures and by water-supply, sewer, heating, and lighting systems. All shelters also have emergency water and food supplies. mainly from radioactivity and thermal radiation. Radiation-proof covers may be located in basements, aboveground in buildings, in cellars, in vaults, or in mines that have been adapted and equipped for this purpose. They may also be specially constructed of various materials, such as builtup or reinforced concrete, wood and earth, adobe, or fascines. The protection afforded by radiation-proof covers is provided by their earthen layers, protective structures, hermetically sealed entrances, and ventilation systems. In radiation-proof covers space is allocated for lavatories and water and food supplies. Radiation-proof covers may be ventilated naturally or by forced air, and the air is supplied by hand-operated or power-driven ventilators. Kammerer, lu. Iu., and A. E. Kharkevich. Ekspluatatsiia ubezhishch grazhdanskoi oborony. Moscow, 1967. Gorshkov, L. M. Kakpostroit’ protivoradiatsionnye ukrytiia na sele. Moscow, 1968.